With its wide woven arms, deep seats, and plush cushions this seating group invites you and your guests to relax outdoors in utmost comfort. 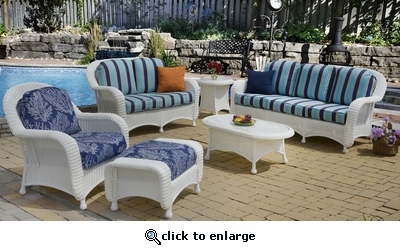 Each piece in this wonderful "All Weather" set is made of soft vinyl/resin fibers that are hand-woven over strong rustproof aluminum frames and includes cushions in your choice of Acrylic fabrics. Sunbrella fabrics available at an additional charge. White, Ebony, or Two-Tone Natural.